Amazon Summary: Eight-year-old Raza is too young to fast, but he longs for the delicious parathas the grown-ups eat before dawn. The aroma of the flaky, golden bread tempts him. He cannot wait for the children’s breakfast, but he’ll get into trouble if anyone finds him up this early. Lying in bed, Raza hatches a plan. Will he get away with it? 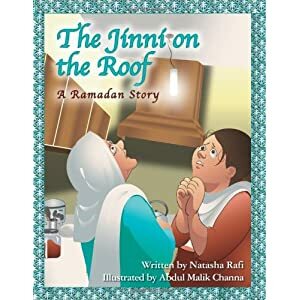 This is a delightful tale about a mischievous boy who learns the true meaning of Ramadan – patience and empathy. Age range 4 -8 years. Link to amazon here! My thoughts: I saw this tale advertised on Facebook and wanted to read it! I reached out to author Natasha Rafi and she sent me one over. 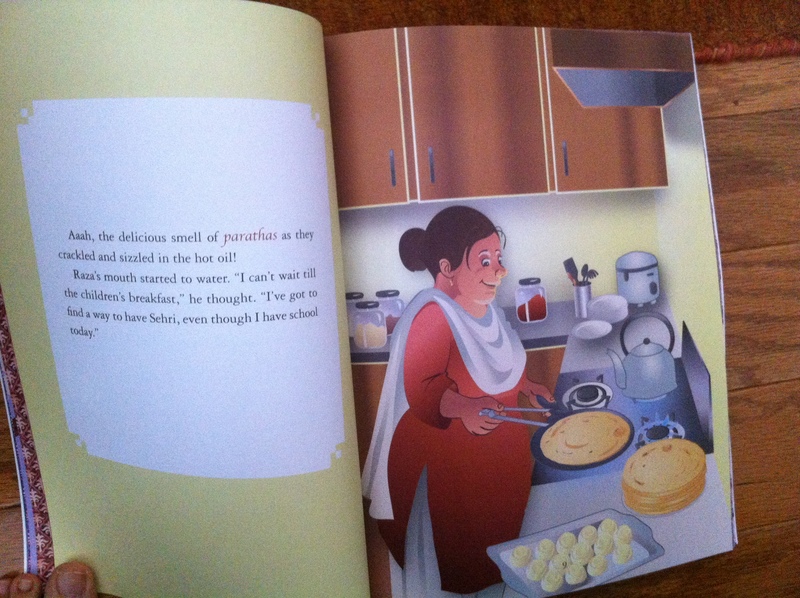 It’s a heartwarming tale of a child who loves parathas! Most children do love parathas so it’s relatable! I also liked that this story was paperback. A lot of children’s books are hardback, but it ‘s nice to have a good quality paperback. I like paperbacks for traveling purposes so I would pack this with a Noor Kids comic book for Z if we were to travel soon! 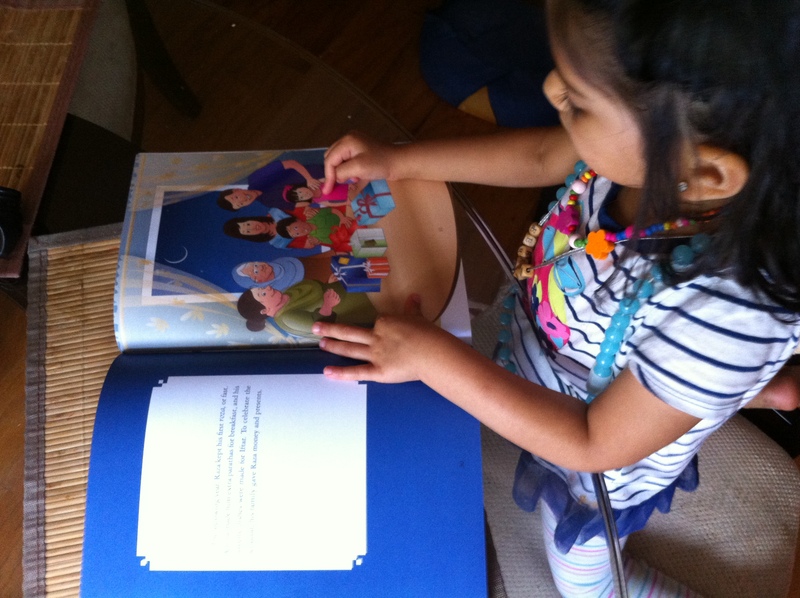 Also the benefit of paperbacks are that they aren’t as expensive as hardcovers so it’s a great book to add to a child’s Ramadan collection or give as an Eid gift, #RamadanReads! The story is set in Lahore – I’m from Karachi, so the descriptions of the cook and sehri hit home for me. Rafi included a glossary at the end of the book which is helpful for non-Pakistani people. There is also an Author’s Note on Ramadan which is helpful for non-Muslims and Muslims. I enjoyed how Rafi describes 8 year old Raza’s escape to the roof and the sounds he hears at Sehri time. It was amusing to read Raza’s thoughts and how he snuck up to the roof. I also enjoyed the illustrations by Abdul Malik Channa, especially of Raza’s nani (or maternal grandmother) as she looks like Z’s paternal great grandmother! Z also enjoyed the little orange cat in the pictures. On his way he passed through room after room filled with heavy wood furniture, stubbing his toe in the dark more than once. Z’s thoughts: Z enjoyed the part where Reza goes on the roof and disguises his voice to scare the cook Amina. It was a fun story to use a scary voice to. 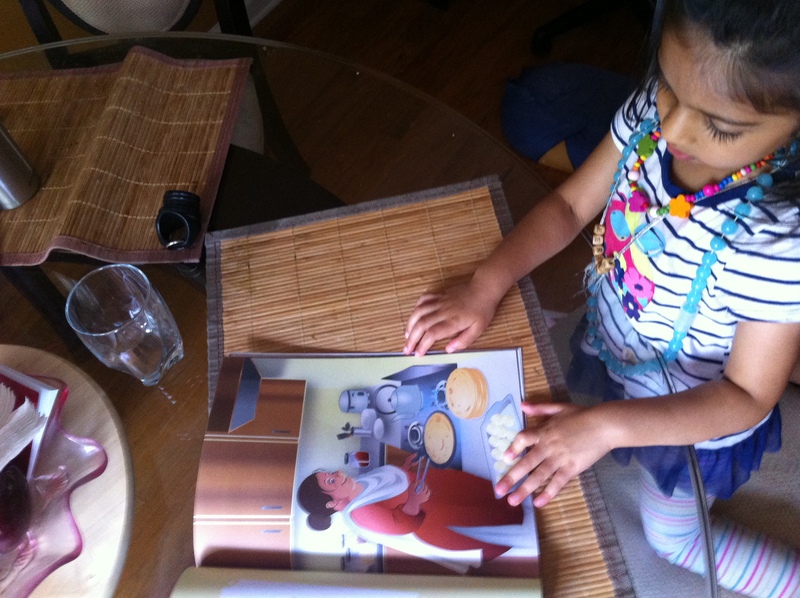 Z also loves parathas so she enjoyed pointing to the balls of dough. 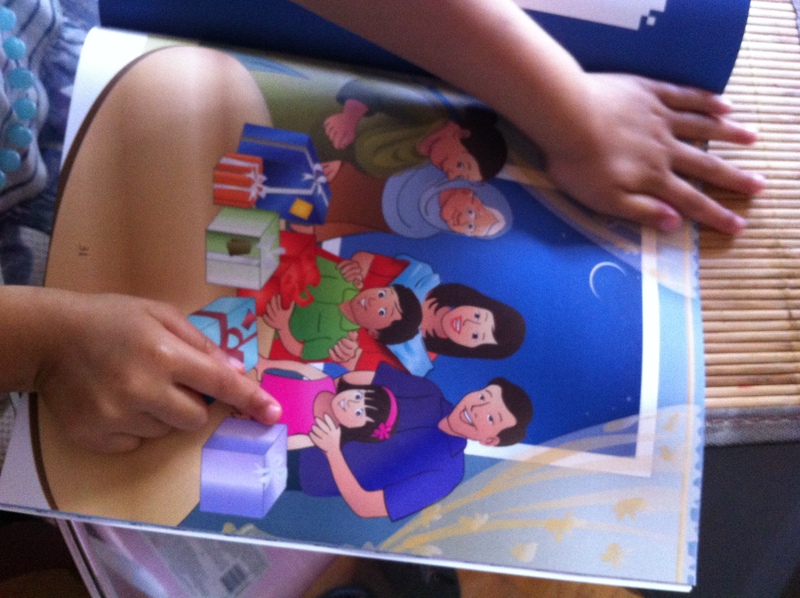 Z also wanted to hear the story of why he wanted parathas and how he got them, over and over again! I loved how the cook sounded like a paratha! Amina the cook was heaving her plump, doughy body up the stairs to his grandmother’s room to wake her up. She had a lot of work to do since the whole family had gathered together in Lahore to celebrate Eid-ul-Fitr, the holiday that marks the end of Ramadan. Shortly after that came the aroma. 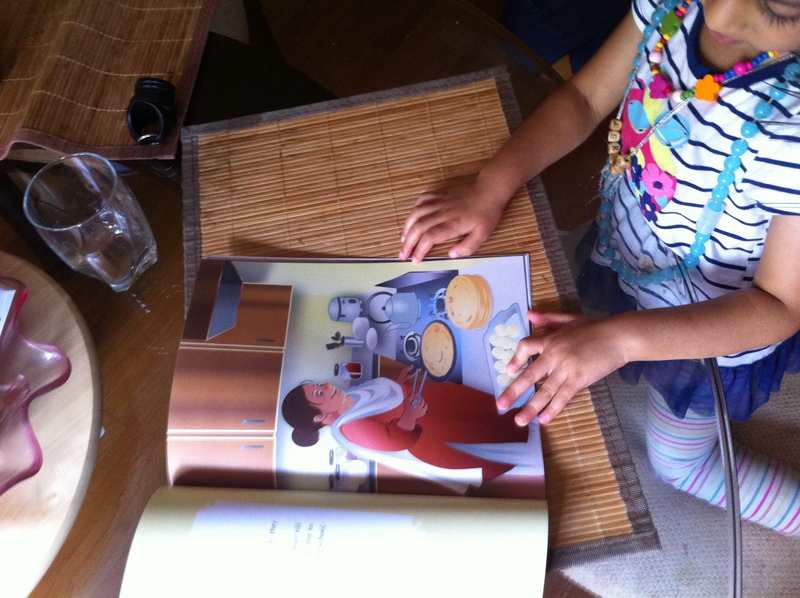 This was Z’s favorite page because Amina the cook was cooking parathas and in Z’s words she really likes parathas!